When it comes to exercise and fitness training, there are a bewildering number of certifications that a person can seek, and the number continues to grow. Many of them are quite legitimate, while some of them are regarded as little more than vanity certifications, since they aren’t at all difficult to qualify for. One that has been in existence for longer than most of them, and which is seen as more prestigious by many, is the CSCS. The National Strength and Conditioning Association conveys the Certified Strength and Conditioning Specialist (CSCS) designation, and has been doing so since 1985. To date, over 21,000 men and women have qualified for this certification. Prepare with our CSCS Study Guide and Practice Questions. Print or eBook. Guaranteed to raise your score. Get started today! One of the reasons the CSCS is considered to be more authentic (and prestigious) than many other fitness and exercise training certifications is that a person must possess a bachelor’s degree (or be very close to completing a bachelor’s degree) in order to be allowed to take the test. A degree in chiropractic medicine is acceptable in lieu of a bachelor’s degree, but these days that’s pretty much moot, as just about every person who goes to chiropractic college does so only after earning a bachelor’s. With some certifications in the fitness industry, the only requirement a person has to meet in order to take the official test is to pay a fee. CSCS Flashcards. 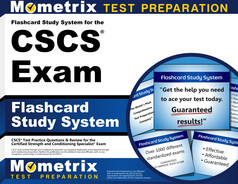 Proven CSCS test flashcards raise your score on the CSCS test. Guaranteed. The prerequisites don’t stop there, either. In addition to a college degree, a person must also possess current certification in CPR and AED in order to take the CSCS exam. CPR stands for cardiopulmonary resuscitation, and AED stands for automated external defibrillators. It’s easy to see that the CSCS is intended only for those who have a deep commitment to the health, safety and fitness of others, in addition to being well educated. It’s precisely this exclusiveness, along with the difficulty of passing the exam, that makes the Certified Strength and Conditioning Specialist such a sought after designation. Passing the exam allows a person to be known as a Certified Strength and Conditioning Specialist, and this is seen as a powerful marketing advantage when it comes to acquiring clients for strength and conditioning training. While passing the exam isn’t easy, and requires a lot of in depth knowledge about fitness and strength development and training techniques, the rewards that come with a passing score on the exam make the hard work and discipline for success on the exam well worth it. Explore our free CSCS review provided by Mometrix. 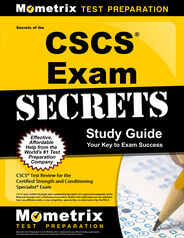 Check out our premium CSCS study guide to take your studying to the next level. If you benefit from these materials, just click the link below! To compliment our CSCS book, we also offer extensive CSCS flashcards for even more CSCS test prep help. We hope you enjoy our products! Your purchase helps us make more great, free CSCS certification content for test-takers just like yourself. *CSCS® and NSCA® are registered trademarks of The Certifying Body for the National Strength & Conditioning Association, who does not endorse, nor is affiliated in any way with the owner or any content of this web site.